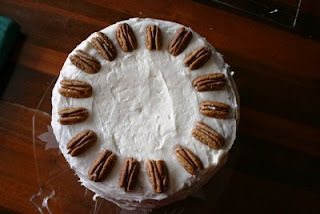 Anyhoo...she read the high altitude instructions and cranked out a beautiful red velvet cake that made me drool. After reading that, I decided it was time to stop being a wuss about baking at high altitude and try again. 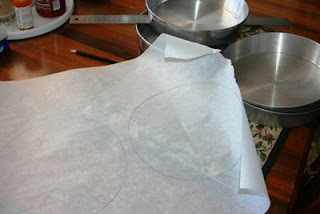 So after the breakfast dishes were cleared, I got out my pencil and my parchment paper and my baking pans and set to it. After oiling and flouring the pans, then putting in the parchment circles, I began the batter. 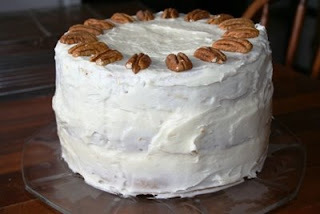 I decided to use a carrot cake recipe from my home church's cookbook. 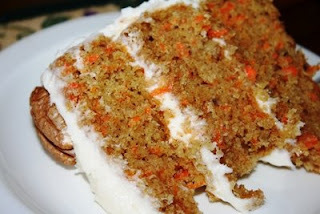 It is Carrot Cake by Mrs. Ikey Robinson. Here's the recipe (with the changes for high altitude). Blend sugar and oil until creamy. Add eggs (one at a time- but don't over beat them) and cream well. Sift flour, soda, salt, baking powder and cinnamon; add to first mixture. 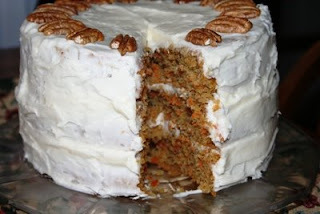 Fold in vanilla, carrots and nuts. 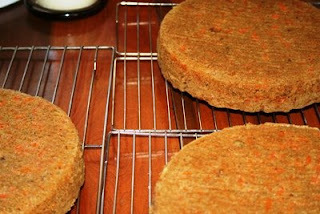 Pour into 3 prepared 8 inch round baking pans and bake at 375 (original recipe said 350) for 30 minutes. And here is the cake after I finished it. I can't believe how well it turned out. Maybe next I'll try my hand at the red velvet..... who knows?? Wow, what a fabulous cake! It looks so delicious. Emmy is a great cook - her Balsamic Red Pepper Jelly is so good.